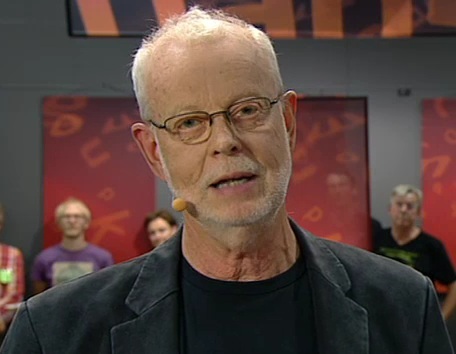 Right: Former Archbishop KG Hammar reading his poem “Hörs en Viskning i Bruset” composed during the first day of the Gothenburg Book Fair and broadcast on the Swedish TV culture programme Babel from the floor of the Book Fair. The following is my attempt at a free translation. Who has time for pastimes? Perhaps I should add that I’ve not seen KG Hammar’s poem in print. This translation is based on his reading on the the Babel TV programme. There was one word I’m not be sure I heard properly. Also, the Swedish for Book Fair is bokmässa (literally book trade fair alt. book mass) which gives KG Hammar a third sense of “mass” to play with. I did what I could with only two senses.